Long before I loved genealogy, I fell head-over-heels for oral history. My great-grandfather, Everett Eames, died in 2005. By that time, I was nineteen, and had been regaled with stories of his years in the logging camps of northern New Hampshire and Maine for over a decade. Everett had a long, colorful life. After working in the lumber camps, he opened Eames Garage in Errol, New Hampshire, before working in the shipyards of Bath, Maine, during World War II. As a child, I would climb into my great-grandfather’s lap, along with my two sisters, and listen to him talk about his life. When I had to choose a topic for the thesis required to earn my master’s degree, I knew immediately what I wanted to do. 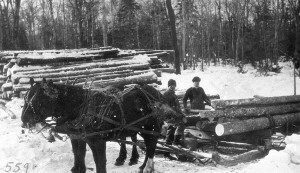 Fueled by memories of my great-grandfather’s logging camp days, I submitted a proposal to conduct oral histories with men and women involved in the lumber industry of northern New England. After receiving approval for my project, I selected interviewees. Everett’s daughter, my grandmother Elsie, married David Hall, a lumberman from Pittsburg, New Hampshire. He retired in 2015, at the age of seventy-seven. I could think of no one who would know more about the lumber industry. My grandfather, a former log truck-driver, knows more people in more places than I can count. His travels took him to mills in Canada, Vermont, and Maine. When he first began working in the lumber industry, he had to load his own logs in the woods. (The logs were cut by men with saws.) Over time, he met several men working in the forests of New Hampshire and Maine; some of their ancestors came from Canada to staff the logging camps that existed in far northern New England in the early to mid-1800s. During my interview with my grandfather, I noticed how often he mentioned the names of people he’d worked with over the years. The small town of Errol has a year-round population of approximately three hundred people. Like many small towns, everyone knows everyone and everything. Some people find this annoying. I, however, find it invaluable. Oral transmissions, whether gossip or family lore, fuel small towns. Oral history, by that definition, has existed since the mid-1900s. At first, interviewers focused on the prominent. Over time, oral history expanded to include the common. Some oral historians have even focused exclusively on minority populations, which tend to be some of the hardest subjects to research. These histories, in their best form, consist of a recording and a transcription. If oral history transcriptions were indexed, genealogical researchers would have access to a treasure trove of information. Why not use this information to guide us in the right direction, or to provide biographical information about our ancestors? While oral history does not qualify as absolute proof on its own, it may help researchers discover more about themselves and their pasts, or provide a road not yet taken for those trying to work around a brick-wall. I have many ancestors/relatives who might well have worked with your grandfather. I would love to see an article by you some day that includes names and origins of these lumbermen. I have several Drew and Pierce ancestors who also followed the lumber trade. The Drews in Maine and Vermont, who were blacksmiths and their skills were certainly needed for the tools required. The Pierces left Taunton, Mass. in 1805 and went to Cattaraugus Co., NY where they cut timber, and apparently made shingles to raft down the Allegheny River to Pittsburgh and beyond. Amazing stories! Julie, I love your piece and especially the reference to indexing. I don’t have much in the way of oral history on my dad’s side of the family but several years ago, I came across a journal that his grandmother wrote, as well as hundreds of photographs that were taken in the mining town in Montana where she lived most of her life. Her journal and the photos have many references to not only other family members but friends who lived in that mining town. 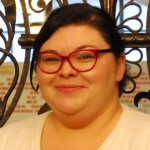 I created a blog to share her journal and the photos, hoping I will attract not only cousins but possibly help descendants of some of the folks who lived in that small town learn something new about their ancestors – and maybe even discover a photo they’ve never before seen. Earlier this week, I was contacted by a woman who is collecting biographical information on one of the “folks” who lived in that town – a woman who went on to become very successful in the medical community in Chicago. So far, I’ve been able to provide her with several journal entries referencing this woman when she was a young girl and even a photograph of her mother. I then offered to do an online of the local newspaper and discovered something I never knew – my great grandmother was this young girl’s piano teacher! Unbelievable. Well put! I just finished digitalizing my husband’s great uncle’s oral history of his youth (a John Clifford Cook) in the early 1900’s on a farm in Winnegance ME (West Bath, ME). Apparently the original manuscript was taken by a grandchild for a school project. His great grandfather & (step) great grandmother and his great-great grandparents are named in it. What a wonderful transmission to have. (His mother handed it to me before she died knowing I was the one interested in family though I’d only married in). I’m from Rangeley, Julie. I live in Minnesota now and I’ve been to Errol so many times I’ve lost count!